These containers, pictured here, provide you with the required elements, order, and punctuation for each of your Works Cited entries. As you work to format your Works Cited entries, you will notice that some sources require only one container, depicted at the right. 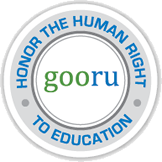 These are sources that you access directly from their original publication, such as books, an online magazine article, and general websites. You should follow the order of items listed in the container, following the simplified punctuation rules you see in the container as well. You will place a period after the author and the title of the source. Then, you should place commas after each item until the end of the entry. 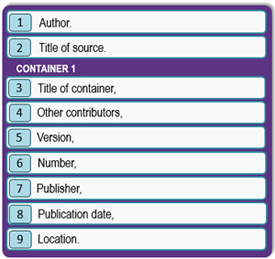 Two containers are required for sources that you access through places like library databases. An example of MLA’s “two container” structure is depicted at the left. Here, you will notice there is a place for the first container, with the original publication information. 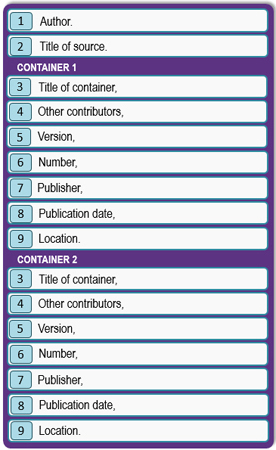 Below the first container, the second container provides publication information for where you retrieved that information. For example, a journal article you access through your library’s databases will have its original publication information (container 1) and access information from the online database (container 2). On the following pages, you can access interpretations of MLA format for Works Cited entries for a wide variety of sources. These interpretations follow the MLA “container” system.